The Indigo fireplace is the epitome of style & class & is suitable for most homes with a traditional brick or masonary chimney. Each is hand crafted from solid Travertine & limestone & has the switchable double down lights for added style. 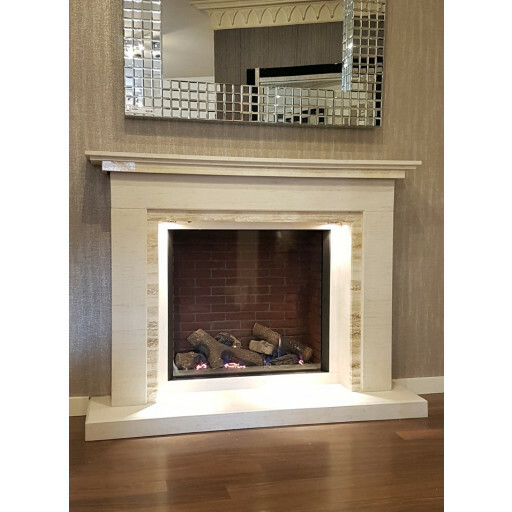 A masterpiece of a fireplace - huge window for the gas flames to show their stuff - looks very real, we are delighted with it. Classy centre piece for your living room. We wanted something unusual with a touch of class and this is exactly that. We didn't need the goods straight away, which they were happy to hold at their warehouse for a couple of weeks.